By now, you have heard and seen a lot of the upcoming affordable iPhone. This latest leak will not surprise you - instead it will cement your certainty about the existence of such a device. An iPhone made out of plastic and coming in five vibrant colors has appeared in images from Taiwan, and you just have got to love the colors. Up until now, Nokia held a near-monopoly on color in smartphones, but Apple is now stepping in its territory with a red, yellow, white, blue and green versions of the affordable iPhone. With its rounded corners and striking colors, the device looks a bit toyish. It carries the Apple logo on the back and just the name iPhone. 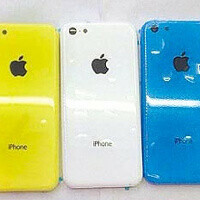 Additionally, images of the high-end Apple iPhone 5S, the rumored successor to the iPhone 5 have also been spotted. The iPhone 5S is made out of aluminum and looks almost exactly like its predecessor. The hardware though is said to have undergone another big updrage. The possible technical specifications of the iPhone 5S include a 4” IGZO display with the same 1136 x 640 pixel resolution, 2GB of RAM, a 12-megapixel camera and 4G LTE-Advanced support. The images below should speak better than words, take a look. Now that's a plasticity phone. Plastic = cheap which is exactly the point with these affordable iPhones. S4 was suppose to be a premium device failed with cheap materials. Did I dumb it down enough? It's like they are going back to the Feature phone design styles and the iPhone 3GS plastic-ky back. Between the new outer colours and iOS 7 turning all pinks and purples shades the iPhone is really starting to look like a girls fashion item,which I suppose has been the iphones main selling point anyhow. Shhhh now u have a cheap plastic phone. Get over it. It will be funny if this plastic is the same with s4!! It only means that s4 is CHEAP!!! I can bet a thousand dollars this will feel far better than S4 in hand, because it's going to be unibody. Please. No more plastic. We already have an over abundance of plastic being used within every industry all over the world that virtually everyone uses. The cellphone industry is completely different and it deserves to use no plastic materials because it is...well, the cellphone industry of course. John B. Plastic is the best material for cellphones as it allows signals to pass through it and is relatively sturdy and cheap. Metal, on the other hand, mostly blocks these waves and are more expensive. Sometimes both plastic and metal are used to solve the signal problem while providing a luxurious metallic feel to the phone, but you can't completely remove plastic. Also remember that there is a distinction between cheapish plastic, like in the Galaxy S4, and premium plastic, like in the Lumia 920.
tell it to the HTC One. I see no wave blockage there. Don't forget too tell HTC too update their phone. I hope you picked up on my sarcasm. I have never seen so much negative emphasis towards Polycarbonate based products in any industry as the cellphone market. It actually becomes counter-productive in consumer advocacy for this simple reason: The weakest link of any device regardless of prestige, elegance, popularity and price is the battery. I would celebrate any manufacture that can design a phone with the finest materials possible yet keep the accessibilty to the most commonly failed component in an electronic device. I'm not willing to waste an insurance claim on a failed battery. Other issues can happen within the two year contract that deserve more relevance. Until then, people are willing to compromise common sense in exchange for aesthetics. John B.
I respect taste and preference, but why would I want to afford this? Black is only for people rich enough to afford a real iphone. I know this sounds like I am trollin' but Apple admitted they want to keep black to the high end iphones. White. All rest look too gaudy. Apple scared of Windows Phone gaining market share ...... Greetzz. Well if the price is right i sure like to eperience IOS. I think it would be $200 more expensieve than 32GB ipod touch for unlocked version, which is not pretty affordable for developing country. But who knows. Not to be an Android fan but the colors of the iPod touch 5G is so much better than this GENERIC LOOKING iPhone. They are like creating a rip-off of the Nokia Lumia which is way better on selecting colors.